Alice is almost in Wonderland! So I have a good feeling Alice will be finish #5 for the year. Here is where she is as of this weekend. 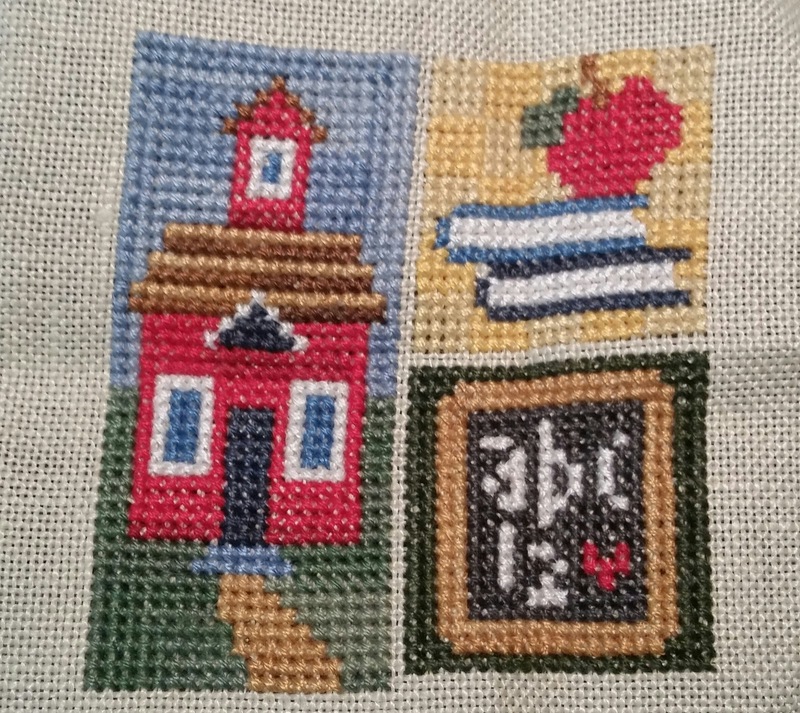 I got a good bit of stitching time in on her as husband was out of town visiting family. I found the fabric on ebay, and think I am going to make Alice into some sort of small wall quilt or pillow. Isn't the clock fabric perfect for her though?!? 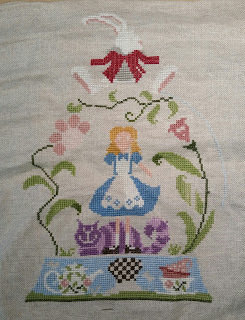 Sorry Alice is so wrinkly, I took her off my stitching hoop just to get a quick progress photo. And while husband was away I did a little thrift shopping over the weekend, and look what I found! 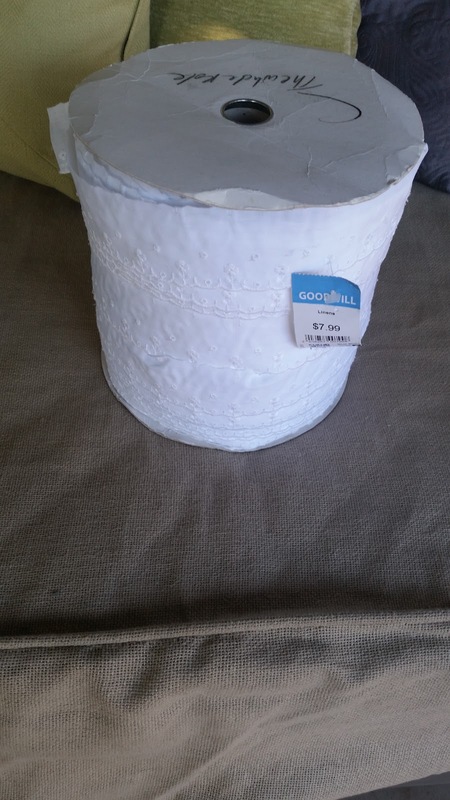 It was half off Saturday at the Goodwill's in our area, and I found the above spool of kind of an eyelet lace trim for $4. 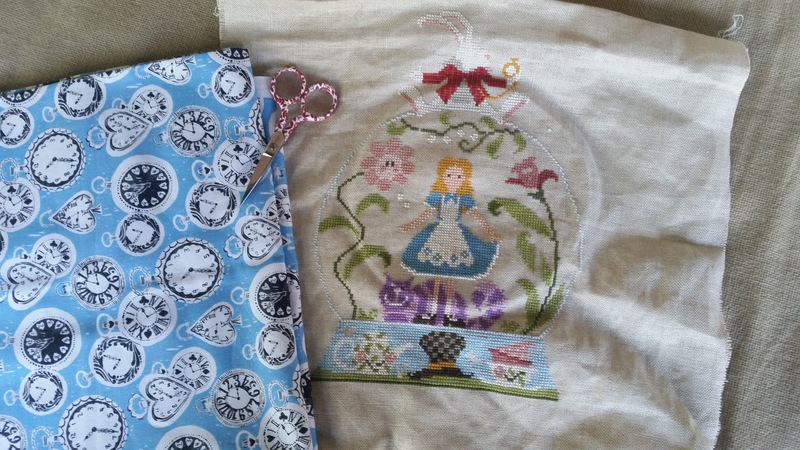 I actually wanted trim for Alice's pillow, but I honestly have no idea what I will do with quite this much of it. The spool is about 8 inches across, and on the bottom it says "365" not sure if that is in feet or yards. If it is yards that's like a half mile of trim! (please don't check my math i'm terrible at it) So I now own a lifetime supply of trim. FYI you can expect to see this on ALL of my future finishes. And here was my BIG purchase for the weekend, a new outside stitchy spot. We have an awesome back porch at this house, and used to have a very old-very cheap futon that too many foster dogs had halfway destroyed and I would not longer sit on (they ripped the stuffing out of half of it). Now that we are on hiatus from dog fostering for a bit, I decided it was time for me to have a comfy stitchy spot again. I love stitching outside in the natural light, and being able to hear birds and the wind in the trees. Here in Arizona this is the perfect time of year to be outside too, it was in the high 60's this weekend. So I found the above daybed on Craigslist (for $100 bucks less than it was still on sale for at World Market) and all of the pillows on it for less than $10 at Goodwill (half off day again). The only thing new I had to buy was the mattress for it (I just can't see buying a used mattress). 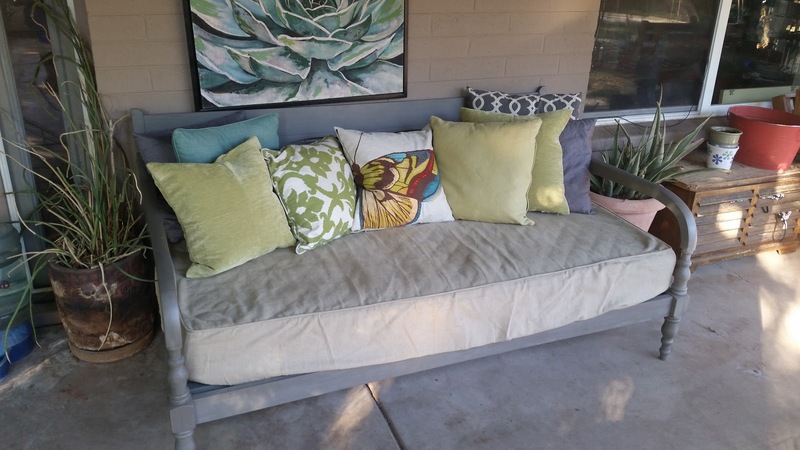 So I am one happy stitcher again to have an outdoor spot again. 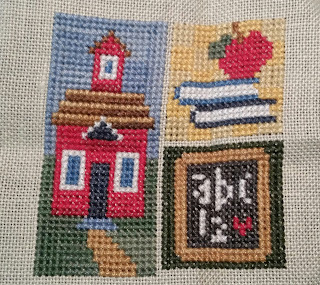 So I did start something new amidst continuing to try and thin out my stitching basket a bit. 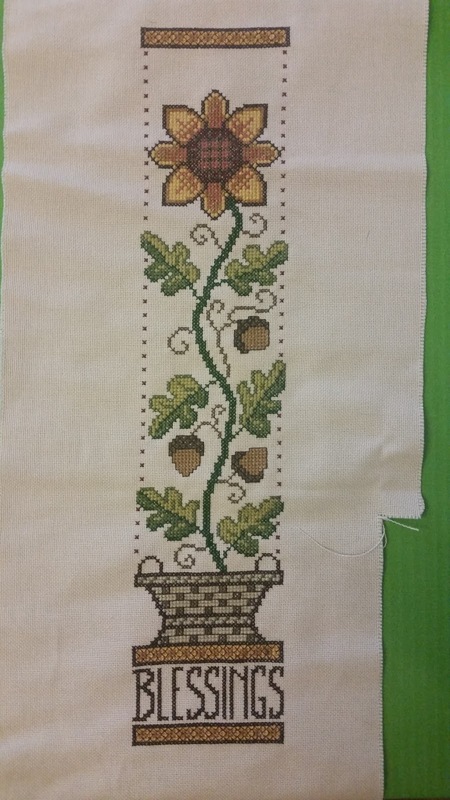 This one was a Christmas present from my family, and I loved it so much I just couldn't wait to start on it. 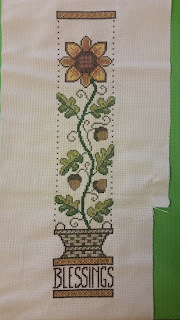 And for less than 2 weeks of stitching, I'd say I have made a good start on it. 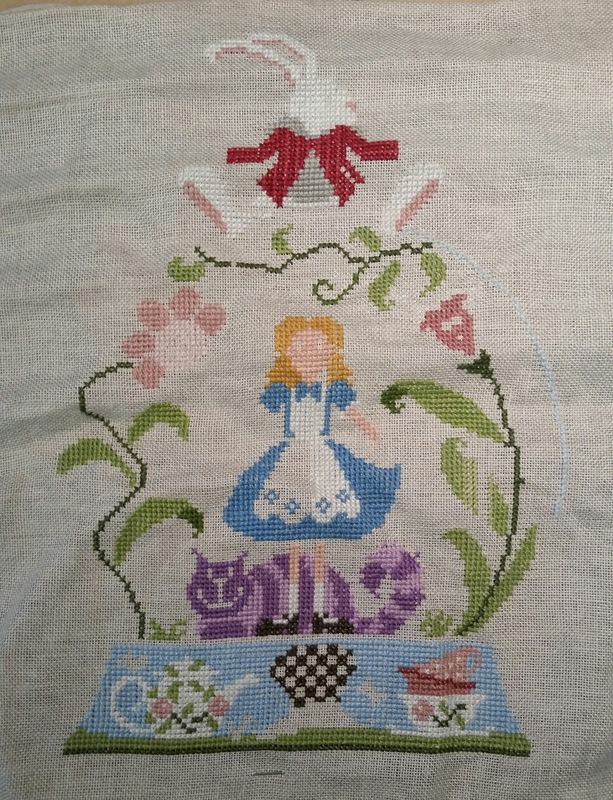 The design is "Alice au Pays des Merveilles" by Jardin Prive. My husband picked it out and then had my two daughters help him gather all the threads needed for it, so it truly was a family gift. I love the design, especially the white rabbit and the flowered tea cups/tea pot along the bottom. I have had some recent finishes too. Finish # 2 for the year is Lizzie Kate's September block. For such a tiny piece this one sure took me a long time to get done. I ahem, started it back in September with the delusion of getting it done in September--how is it January already! 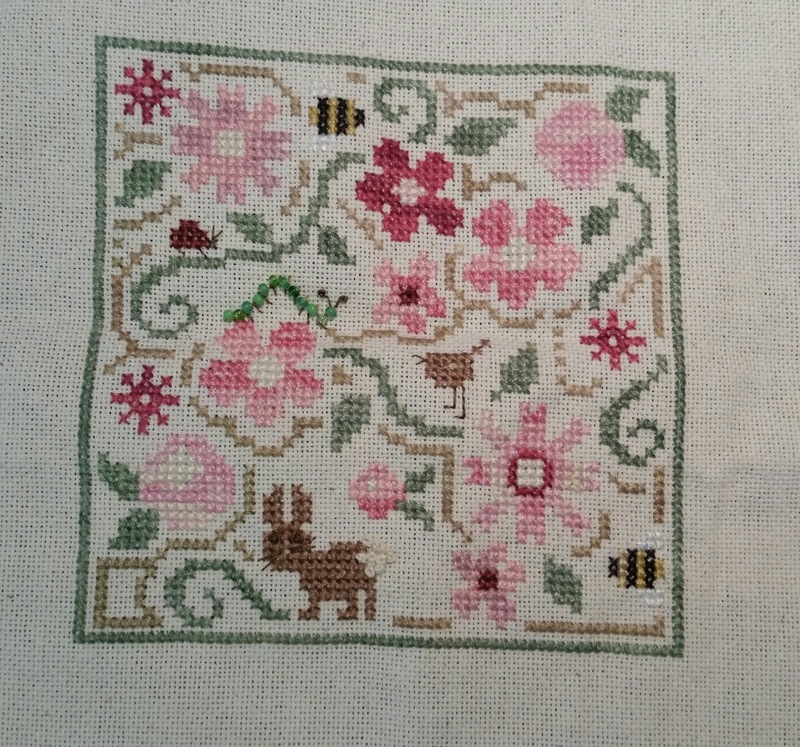 And Cricket Collections "Playing with Jacks" got the final stitches and back-stitching put in it. 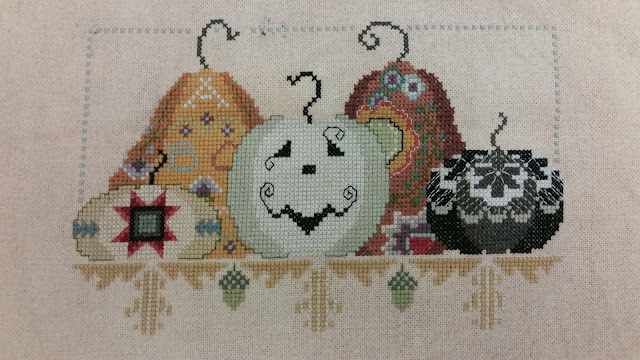 I originally was only going to stitch the black pumpkin on the right hand side of this design, but am now so glad I went ahead and stitched the whole thing. And finish #4 for the month (that puts me ahead by one if your counting-my goal was 3 finishes a month) is Trilogy "Secret Flowerbed". This was another small that took me forever to get done. 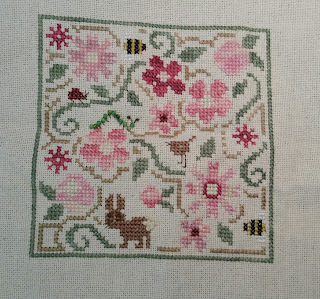 I did little french knots for the bunnies tail, and the used tiny green seed beads for the caterpillar. Pretty happy with how this one came out, but no idea how I will actually finish it. Busy busy start to my New Year, we have lots of winter birthdays in our family, so it feels like the holiday celebrations have stretched on and on. But things are finally calming down a bit (knock on wood). I am slowly working on my WIP basket, my goal for last year was to complete 25% of my unfinished projects, and I succeeded. 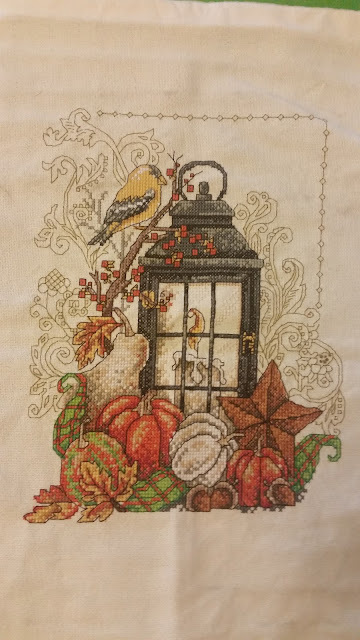 I finished 13 cross stitch projects in the last 3 months of 2016. So my goal for the first 3 months of 2017 is the same, but a slightly smaller number. To finish 25% of my WIP basket I will need to finish 9 projects or 3 per month. This month I have already completed 2, so only 1 more to meet my goal for this month. Normally I have never cared how many projects I have going at once, but I must admit it does feel nice to have a slightly smaller stitching basket.